New York, NY – 8 June. 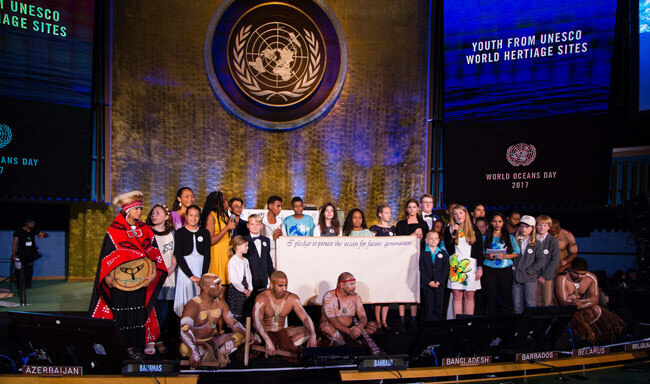 HSH Prince Albert of Monaco II was the first to sign The Ocean Pledge launched by youth from UNESCO World Heritage Marine sites at the United Nations. He was joined by, Ms Irina Bokova, Director-General of UNESCO as well as Adrian Grenier United Nations Goodwill Ambassador for the Environment. The pledge, which reads ‘I pledge to protect the ocean for future generations’ was also signed by a representative from the government of Australia among other dignitaries. The children travelled from some of the remotest places on Earth to highlight the global nature of the threats posed to the ocean, and the need for collective action. Decisions made today will have a ripple effect for generations to come. Each child lives in a UNESCO marine World Heritage site, an area recognized for its Outstanding Universal Value, and protected for humanity under the 1972 UNESCO World Heritage Convention. The international community has committed to care for our natural wonders. Like the rest of the world’s ocean, World Heritage marine sites are suffering from the impact of climate change, including warming waters, more powerful storms, rising sea levels, and ocean acidification. Video pledges have been posted from across the planet including sites such as the Galápagos Islands in Ecuador, the Wadden Sea in Netherlands/Germany/Denmark, The Great Barrier Reef in Australia and the Phoenix Islands Protected Area in Kiribati to name a few. This initiative is made possible by the generous support of the Government of Flanders, the Explorers Club, Stefan & Irina Hearst and the Khaled bin Sultan Living Oceans Foundation.